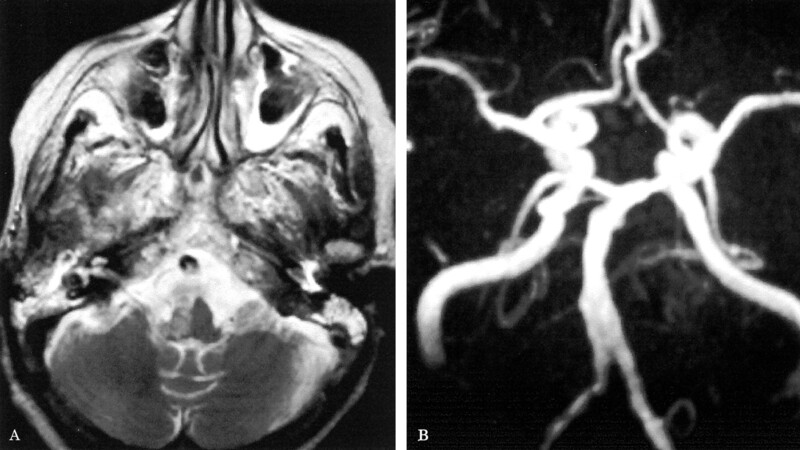 An 81-year-old woman with hypertension and diabetes presented with left hemiplegia, reduction of superficial perception on the right side of the face and on the left side below the neck, and cerebellar ataxia of the right limbs. Right Horner’s syndrome, right facial paresis, dysarthria, hoarseness, dysphagia, and paralysis of the right soft palate and right side of the tongue were present. Cranial MRI showed a right hemimedullary infarct, and magnetic resonance angiography showed severe stenosis of the right vertebral artery (figure). Figure. T2-weighted MRI section of the medulla shows an infarct involving the right hemimedulla (A). MR angiography shows severe stenosis of the terminal segment of the right vertebral artery (B). Babinski J, Nageotte J. Hémiasynergie, latéropulsion et myosis bulbaires avec hémianesthesie et hémiplégie croisées. Rev Neurol (Paris) . 1902; 10: 358–365. Mossuto-Agatiello L, Kniahynicki C. The hemimedullary syndrome: case report and review of the literature. J Neurol . 1990; 237: 208–212.